What’s the latest forecast update? Happy First Day of Spring! Our complicated nor'easter storm system has arrived, and weather conditions will deteriorate significantly over the next 48 hours. All week long, as both computer models and meteorologists have struggled to get a handle on this storm's impacts, I stuck to one very important rule: Given the numerous challenges of late-season snowstorms, I would not promote major snow totals unless there is sufficient evidence to support such a forecast. Well, there is now clear evidence that this is going to be a significant storm for New Jersey. We find ourselves right in the bullseye of snowfall from this pair of storms. My latest math shows most of the state receiving 6 inches of heavy, wet snow by Thursday morning. If heavier snow bands set up, and if surfaces are cold enough to sustain accumulation, totals will push closer to a foot. In addition, this storm will bring the return of fierce wind gusts and coastal flooding. No matter where you live in the great Garden State, you will feel severe impacts from this storm. Will I make it to work/school Tuesday morning? Yes, no problem. Showers and sprinkles have started to pop in South Jersey, but the radar has been mostly quiet so far. Bands of wintry mix (mostly rain and sleet) will slowly spread through New Jersey Tuesday morning. Don't expect much to start — our atmosphere is pretty dry right now, and temperatures will be above-freezing at precipitation onset. How does my Tuesday evening commute look? Here's where things start to get sloppy. By Tuesday afternoon, the wintry mix will get heavier, and we'll transition to a bit more snow than rain/sleet. Given the temperature of the air and the ground, snowflakes are going to struggle to accumulate (especially on treated surfaces) initially. Still, a slushy inch or two will be possible on the roads by this evening's commute, especially along the Interstate 295 corridor in southwestern New Jersey. A bit slippery, with pockets of low visibility, but travel conditions will be mostly manageable during the day on Tuesday. Will I make it to work/school OK Wednesday morning? Maybe. As we transition from low pressure #1 to low pressure #2, the spread and intensity of snowfall will increase through the Wednesday morning hours. By about 9 a.m., bands of very heavy snow become possible, pushing road conditions downhill very quickly. What about my drive home Wednesday afternoon? Given the inclement and downright dangerous weather conditions, widespread school closings are likely on Wednesday. When will the snow finally end? As our storm system pushes out to sea, snowfall will taper from west to east through early Thursday morning. Snow should be done completely daybreak Thursday. If the highest snow totals verify, I expect another round of school delays and closings on Thursday. High temperatures will be in the 40s with increasing sunshine through the upcoming weekend, kickstarting the snow melt nicely. Are we going to see power outages again? Probably. Once again, with temperatures near the freezing mark, this snow is going to be wet and heavy. Peak wind gusts will hit 40 mph across interior New Jersey, with 50+ mph gusts possible along the coast. As we've seen several times already this month, dense snow and fierce wind gusts are not a good combination. Scattered power outages are likely once again. Are we going to see coastal flooding again? Yes. Even though the latest tidal guidance is a few inches lower than last night, the situation along the coast remains very concerning. A persistent on-shore flow during storm #1 will push a lot of water toward the Jersey Shore through the duration of storm #2. What warnings and advisories have been issued? --Wind Advisory from 8 a.m. Tuesday to 6 p.m. Tuesday for coastal Atlantic and Cape May counties. --Coastal Flood Warning from 8 p.m. Tuesday to 5 a.m. Thursday for Atlantic, southeastern Burlington, Cape May, Cumberland, and Ocean counties. --Winter Storm Warning from 6 p.m. Tuesday to 2 a.m. Thursday for Atlantic, Burlington, Camden, Cape May, Cumberland, Gloucester, Hunterdon, Mercer, Middlesex, Monmouth, Morris, Ocean, Salem, Somerset, Sussex, and Warren counties. --Winter Storm Warning from Midnight Wednesday to 8 a.m. Thursday for Bergen, Essex, Hudson, Passaic, and Union counties. 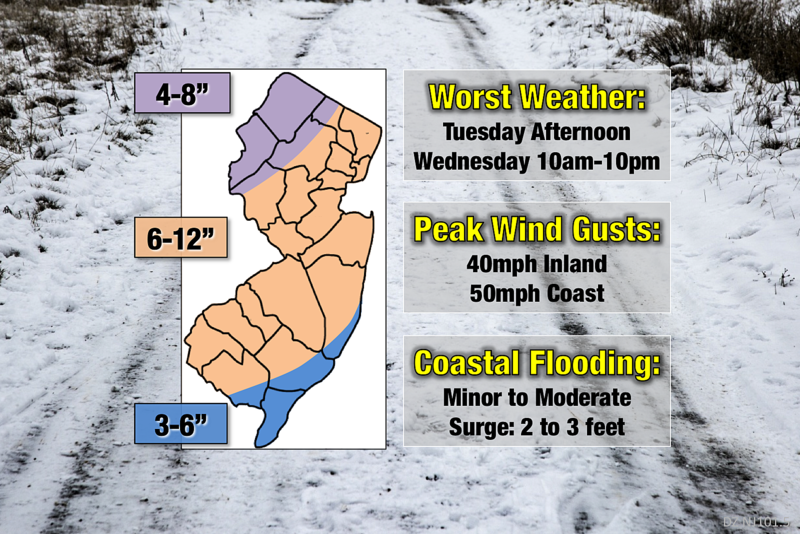 --Coastal Flood Advisory from 9 a.m. Wednesday to 5 a.m. Thursday for Middlesex and Monmouth counties. --Coastal Flood Advisory from Noon Wednesday to 5 a.m. Thursday for Salem county.